High quality medical components—whether for implants, instruments, or IV bags—must be safe and durable, because lives literally depend on them. Low toxicity, high biocompatibility, chemical inertness, and the ability to repeatedly withstand sterilization environments (like gamma rays, steam, or EtO) are all requirements of the materials that long-life medical components are made of. The ability to safely reuse the same medical devices reduces the cost of medical care, while re-use procedures put in place protect not only the healthcare professional, but also the patient’s health and safety. For disposable, single-use medical parts where repeated sterilization isn’t a requirement, the toxicity and biocompatibility requirements, however, still apply. In addition, those single-use parts must be cost-effective for the manufacturer and affordable for the consumer. For both categories of medical components, plastics and elastomers (rubbers) are the materials of choice. Since medical grade thermoplastics (which harden when cooled down to near ambient temperature) and silicones (like LSR which permanently sets when heated) have a lot to offer designers of new molded medical components, we’ll be discussing them in this post. Very chemically inert: Medical grade silicone resists attack from disinfecting chemicals and biochemical interaction. Medical grade silicones have excellent biocompatibility. Strong, flexible, and durable: Silicones have high tear and tensile strength, great elongation, and low compression set, even over a wide temperature range. They’re high elasticity and flexibility is a great match for applications such as feeding tubes and seals for peristaltic IV drug delivery pumps. Sticky when it needs to be: Although silicone has a low surface energy (and is thus used in applications that need to repel liquids), there are formulations of Liquid Silicone Rubber (LSR) that are self-adhesive and can stick to other plastics without priming. Overmolding silicone to specific thermoplastics is a common occurrence for durable medical devices that need extra grip capabilities for the doctor/nurse. Silicone is permeable and thus makes a great matrix for pharmaceutical delivery in drug-eluting implants. Wide range of available durometers: from 0 Shore A to 80 Shore A. This customizability makes it great for applications like clinical and surgical instrument grips, gaskets and o-ring seals. All of these features are why medical grade silicones have been widely used for decades, and will continue to be considered, in spite of LSR’s higher cost compared to some other resins. Polysulfone (PS): This thermoplastic elastomer (TPE) has excellent resistance to both hydrolysis and heat, and thus can be sterilized by steam and autoclaving. PS has great biocompatibility, and can be thermoformed by injection molding and extruding. Polyether ether ketone (PEEK): PEEK maintains its excellent chemical resistance and mechanical stability at high temperatures (and thus can be sterilized by heat and disinfected by chemical agents). Like both silicone and PS, PEEK can be molded, albeit at very high temperatures (PEEK melts at about 343°C). Since PEEK resists biodegradation, it’s a good candidate for implantable medical devices. Medical device OEM’s can choose from many polymers for their next innovative, life-saving product. Although silicones continue to dominate (particularly in implantable devices), some thermoplastics have long been chosen for use in healthcare. 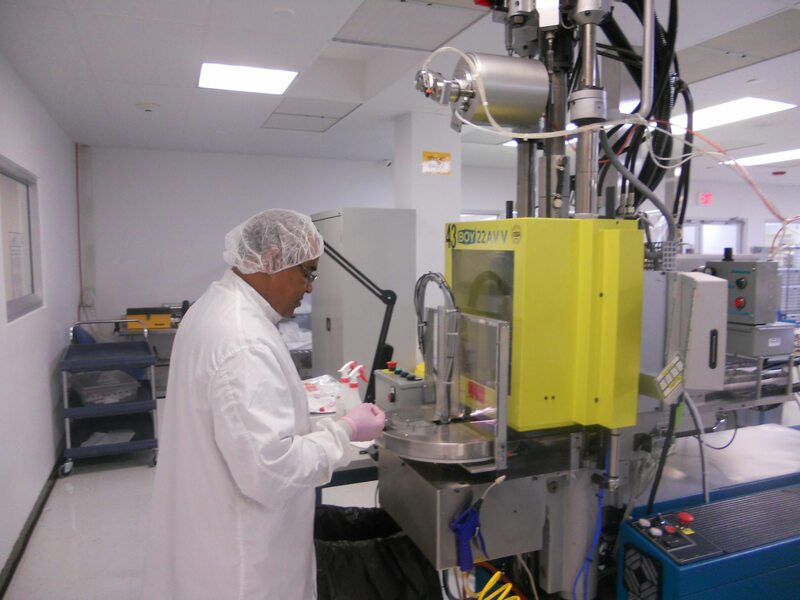 ProMed’s extensive LSR and thermoplastic expertise and manufacturing capabilities can take your molded medical product from concept to completion, just as we have for so many other global OEMs. Medical grade thermoplastics, which harden when cooled down to near ambient temperature and silicones, like LSR which permanently sets when heated, have a lot to offer designers of new molded medical components.